Do cheer up, Alice dear! This is the first Alice in Wonderland - the namesake. 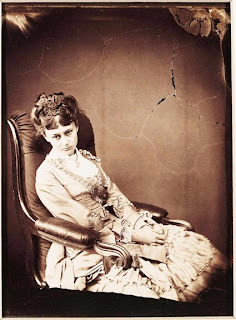 It's Alice Liddell, one of three girls to whom Lewis Carroll told the original story of Alice Through the Looking Glass. They urged him to write it down, and the rest is history. The Globe and Mail has a wonderful slide show of Alice through the ages, including an Annie Lebowitz portrait, one by the Hunter S. Thomson illustrator and this one, from the movie. Please do encourage your child to read the book, or read it out loud to them. It's so worth it. It's also a good idea to show them the Globe's slide show. Reading extensions like seeing the movie or getting a taste for the background of a book can really help to get kids reading. I am so much excited to watch alice in wonderland. I like it so much specially that jonhney deep is there.